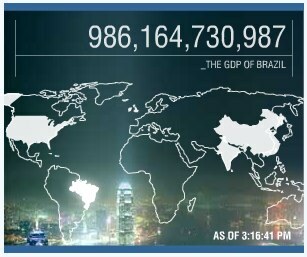 Brazil, according to IBM’s ad (seen at WSJ.com a few hours ago). seems a little smallish to me. Compare the borderlines with those of Wikipedia’s map here. Also, the number for the GDP seems to be a little off. The CIA World Fact Book estimates a GDP (official exchange rate) of $1.314 trillion (2007 est.). Recently, some guys on German TV got fired because they couldn’t get the national flags right: the German flag had the right colors, but the sorting was wrong. Then, the US flag was shown with an extra white row below.